Rachel has been working as a mentor, instructor, software developer, architect and DBA for nearly 20 years. During her career, Rachel has worked with a variety of languages, technologies and systems and has contributed to projects of all sizes including large scale enterprise applications at some of the world’s leading companies. Rachel is the Vice President of the .Net Valley user group, as well as a leader and regular speaker in the Philly.NET and Central Penn.NET user groups of Pennsylvania. She can also be found speaking at code camps, user groups, community events and conferences. 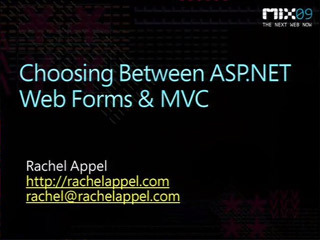 Rachel’s expertise lies within developing solutions that align business and technology using the Microsoft .NET family of products, particularly ASP.NET & SQL Server. She is also an ASP.NET MVP, ASPInsider and holds the Microsoft Certified Trainer, MCAD & MCSD certifications. She is also a member of the INETA speakers bureau.